Web Communication maintains a Slack team for the web community at WSU. Anyone with a wsu.edu email address can join this team to discuss web related topics. Our hope is to foster web related discussion with various groups at the University. While this isn’t an official support channel, it can be useful as a way to bridge the gap between our weekly open labs. 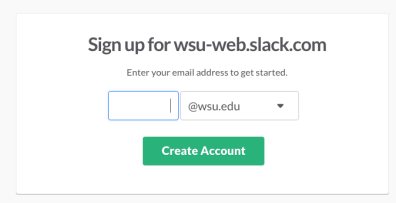 To join the Slack team, go to https://wsu-web.slack.com/ and click on the create an account link or go directly to https://wsu-web.slack.com/signup. Rather than suggest how to use Slack, we’ll leave it up to the community to determine the best methods. If you do have a good resource to share, please leave it in the #general channel and we can post it here. If you have any questions about joining the Slack team, please stop by our weekly open labs.